The first flight of NASA’s new rocket, the Space Launch System (SLS), will carry 13 low-cost CubeSats, including one from Arizona State University, to test innovative ideas along with an uncrewed Orion spacecraft in 2018. These small satellite secondary payloads will carry science and technology investigations to help pave the way for future human exploration in deep space, including the Journey to Mars. SLS’ first flight, referred to as Exploration Mission-1 (EM-1), provides the rare opportunity for these small experiments to reach deep-space destinations, as most launch opportunities for CubeSats are limited to low-Earth orbit. Included in these secondary payloads is ASU’s Lunar Polar Hydrogen Mapper (LunaH-Map) CubeSat, headed by planetary geologist Craig Hardgrove and co-investigator, astronomer and planetary scientist Jim Bell of the School of Earth and Space Exploration. "The first launch of SLS and the selection of the LunaH-Map mission provides a fantastic opportunity for ASU to demonstrate the scientific capabilities of tiny, low-cost spacecraft in interplanetary space,” Hardgrove said. 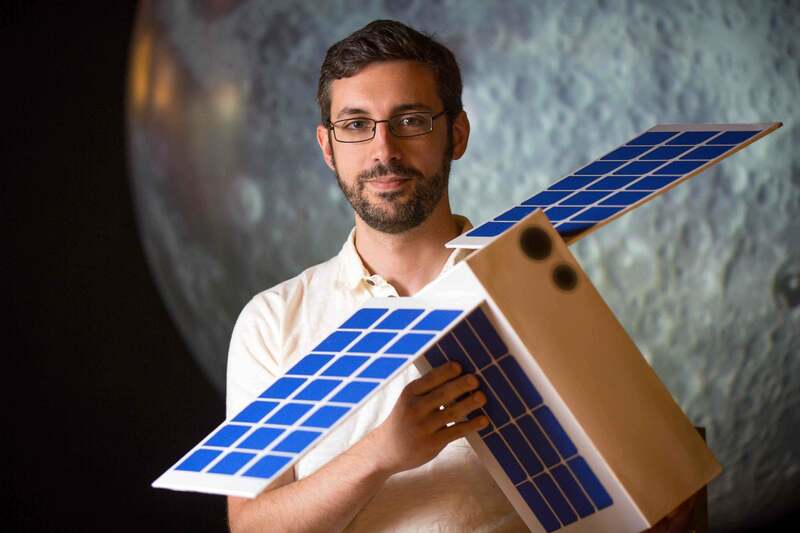 The LunaH-Map CubeSat, to be designed and built at Arizona State University, is shown in an artist rendition by Sean Amidan. The LunaH-Map satellite will produce a detailed map of the Moon’s water deposits, helping NASA understand how much water might be available, which will guide NASA’s strategy for sending humans farther into the solar system. “The 13 CubeSats that will fly to deep space as secondary payloads aboard SLS on EM-1showcase the intersection of science and technology, and advance our journey to Mars,” said NASA Deputy Administrator Dava Newman. • Skyfire — Lockheed Martin Space Systems Company, Denver, will develop a CubeSat to perform a lunar flyby of the moon, taking infrared sensor data during the flyby to enhance our knowledge of the lunar surface. • Lunar IceCube — Morehead State University, Kentucky, will build a CubeSat to search for water ice and other resources at a low orbit of only 62 miles above the surface of the moon. • Near-Earth Asteroid Scout, or NEA Scout will perform reconnaissance of an asteroid, take pictures and observe its position in space. • BioSentinel will use yeast to detect, measure and compare the impact of deep-space radiation on living organisms over long durations in deep space. • Lunar Flashlight will look for ice deposits and identify locations where resources may be extracted from the lunar surface. • CuSP — a “space weather station” to measure particles and magnetic fields in space, testing practicality for a network of stations to monitor space weather. • LunaH-Map will map hydrogen within craters and other permanently shadowed regions throughout the moon’s south pole. Three additional payloads will be determined, and NASA has also reserved three slots for payloads from international partners. Advanced discussions to fly those three additional payloads are ongoing, and they will be announced at a later time. Top image: Craig Hardgrove and a full-size model of the LunaH-Map CubeSat. Photo by Charlie Leight/ASU Now.